In most instances, there isn't one main cause of a systematic breakdown in phonics instruction. Rather, a combination of causes can create a perfect storm of failure. Picture a class of kindergarteners singing the alphabet song, and teaching phonics seems as easy as one-two, three, A, B, C, right? 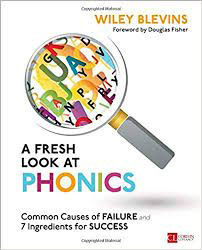 In A Fresh Look at Phonics, Wiley Blevins explains why it can get tricky, and then delivers a plan so geared for success, that teachers, coaches, and administrators will come to see owning this book as a before and after moment in their professional lives. In this amazing follow up to his renowned resource Phonics From A-Z, Wiley uses the data he has collected over two decades to share which approaches truly work, which have failed, and how teachers can fine-tune their daily instruction for success. In a final section, Wiley details the ten common reasons instruction fails and shows teachers how to correct these missteps regarding lesson pacing, transitions, decodable texts, writing activities, assessment and more. A Fresh Look at Phonics is the evidence-based solution you have been seeking. Wiley Blevins has taught elementary school in both the United States and South America. A graduate of Harvard Graduate School of Education, he has written over 15 books for teachers including Phonics from A to Z, Building Fluency, Teaching Students to Read Nonfiction, and most recently, A Fresh Look at Phonics, (Corwin Literacy 2016). He has authored elementary reading programs, conducted research on topics ranging from fluency to using decodable text, and regularly trains teachers throughout the U.S. and Asia. His current interests include using adaptive technology and working with districts to correct instructional and material deficits. Wiley lives in New York City and also writes children’s books.